Cashiers, North Carolina is fast becoming one of the premier golf destinations in the world. With 15 world-class private golf, croquet and tennis communities in the area, as well as 3 courses with public access to choose from, you will find everything you want here in Cashiers. There are over 60 miles of fairways in this area! Each of the clubs here has a link to a page with additional information on the course or court. Visit Cashiers North Carolina, the Heart Of The Blue Ridge Mountains! Burlingame is a private, member-owned Country Club located on 500 pristine acres in the mountains of Western North Carolina in Sapphire. The development of villas, condos and single family homes is flanked by a Tom Jackson designed, 18-hole Par 72 golf course. The federally designated "Wild and Scenic" Horsepasture River runs through Burlingame along with waterfalls, streams and lakes. A variety of rare plants and flowers and an abundance of wildlife abound in this slice of the Blue Ridge. Members enjoy a healthy lifestyle, stunning amenities and a diverse social calendar. Resting on 50 gorgeous, lakeside acres, Cedar Creek Racquet Club is one of the best-kept secrets in the Cashiers-Highlands area. It's the perfect place for you to unplug from the everyday stresses and reconnect with life - and those you share it with. At a refreshing 3,500-foot elevation, Cedar Creek is located just east of the heart of Cashiers on US 64. Chosen by World Tennis Magazine as one of the top twenty tennis facilities in the country, Cedar Creek offers a host of activities during the season. In addition, you'll also enjoy fabulous dining, a full social calendar, kids programs and so much more. If you're looking for a place to spend some family time, or are looking to be part of a family, we welcome you to come and see what we're all about. The Chattooga Club is a family-friendly private club and residential community, reminiscent of the exclusive, family-focused mountain retreats of the early 1900s. Established in 1988, The The Chattooga Club blends regional, cultural and architectural heritage with modern luxury, amenities, and activities to create a warm, peaceful escape where families, friends, and business/civic leaders come together in a perfectly private setting to relax, rejuvenate, reconnect, renew - and always return. The Country Club of Sapphire Valley is recognized as one of North Carolina's premier private clubs. CCSV is a seasonal and member owned Club located in the heart of Sapphire Valley in Western North Carolina. There are few places more special than Cullasaja Club. This intimate golf and family club community nestled into North Carolina's Blue Ridge Mountains offers Members 'Simply the Perfect Life'. Featuring less than 300 homes, the community boasts a stunning mountain Clubhouse, a premier golf course, gourmet dining and a full roster of Club activities including tennis, croquet, swimming, boating, and a first class fitness and wellness facility. This Highlands, North Carolina retreat has become a second home to friends and family who return year after year. We invite you to learn more about life within the gates of this unique and beautiful community. Since 1922, the 1400-acre High Hampton Inn & Country Club, surrounded by the ethereal beauty of the Blue Ridge Mountains in Cashiers, North Carolina and shimmering lakes and streams, has been hosting generation after generation of guests who return time and again to renew, rejuvenate and reconnect amidst nature's playground. The epitome of a true North Carolina mountain resort, High Hampton resides at a 3,600-foot elevation in the Blue Ridge Mountains of Cashiers, North Carolina. The estate's sanctuary-like atmosphere is completely unequaled. The near-perfect climate merely adds to the sense of serenity here, but so does the fact that there are no electronic devices, like telephones or televisions in the guestrooms, and that many activities are nature-driven. Life at Highlands Falls is a flurry of activity from the opening of the Club in May through its closing at the end of October. It is here that Members find a place to escape from the stresses of everyday life, connect with family and friends, forge close friendships, and create lasting memories. Creating balance is key to living a healthy life and Highlands Falls Country Club offers a myriad of ways to do just that. Spend a morning on our breathtaking golf course, work out in our state-of-the-art fitness center, relax by the pool, enjoy an afternoon on the croquet lawns, or just take in the spectacular scenery; whatever your pleasure it will do wonders for your peace of mind. Founded in 1928, Highlands Country Club is the premier, family-oriented private club in the North Carolina mountains. It is steeped in rich history and tradition, from its Donald Ross designed golf course to its community of caring members. 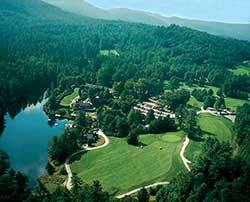 Just off the shoreline of North Carolina's largest private lake, Lake Toxaway Country Club is surrounded by picturesque scenery. This private club is the social hub of our community, where families and friends gather eight months of the year to enjoy the finest in facilities and amenities. Lake Toxaway Country Club offers members and their guests casual and fine dining in four locations, a championship golf course and 20-acre golf learning center, five tennis courts, world-class croquet facilities, a state-of-the-art fitness center, an outdoor swimming pool, and a number of special country club activities and events throughout the season. Mountaintop Golf & Lake Club is a private mountain retreat for families seeking the finest golf, private club and outdoor recreation experience available in the Carolina Blue Ridge Mountains. Mountaintop is a private mountain retreat where the opportunity for membership is by invitation only. Focusing primarily on providing an exceptional Carolina mountain experience, traditional and playable golf, luxurious mountain lake recreation and unforgettable family outdoor fun, Mountaintop members enjoy rustic, yet refined adventures amidst the grandeur and traditions of the Carolina Blue Ridge Mountains. This Tom Jackson sculpted course is an architectural marvel with inspiring views from elevated tees and greens cascading along the Eastern Continental Divide. Players of all levels enjoy perfect conditioning, warm southern hospitality and superb mountain golf. Jackson designed the course from the natural topography of the mountain plateau, providing a captivating 18-hole design with an intriguing dual personality. The front side lulls you into a serene mountain valley of greenery and meandering streams. As you approach the turn, a 250 foot ascent delivers you to the 10th tee giving you the feeling of being on top of the world. The next three holes take you around one of the highest ridges of golf on the east coast. Your final descent toward the clubhouse takes you alongside a shear granite cliff on the right-hand side of number 18. Red Bird Golf Links is a full-service golf course serving the Sapphire Valley, NC area. We feature a 9-hole golf facility designed by Reid Horne. We guarantee good amenities and great customer service. Tucked away in the Sapphire Valley and Cashiers Plateau Resort area, Sapphire National Golf Club is an 18 hole mountain course, offering one of the most delightful rounds you'll ever play. With its scenic mountain views and surrounding lush forests, Sapphire National is truly breathtaking, and with available lodging nearby, it serves as an ideal retreat for the avid golfer. Our golf professionals provide expert guidance and will have you out on the course in record time. Located in a resort community, we deliver or exceed expectations at an affordable rate. We have some of the best golf holes in North Carolina including a waterfall hole, island green and the "Rock" green. Experience mountain resort amenities at Sapphire National GC and Sapphire Mountain Brewing Company and see why the Sapphire/ Cashiers valley has been the premier vacation destination for over a hundred years. Welcome to Trillium, a private residential, lake and golf community nestled in the heart of the Blue Ridge Mountains of North Carolina - breathtaking natural beauty, vast skies and virtually limitless outdoor recreational opportunities. This is the place where you and your family can return to the things that truly matter and "getting away from it all" feels like finally coming home. The spectacular natural beauty that characterizes Trillium's sophisticated golf course reminds us of why we play "The Old Game" in the first place. By combining natural elements with careful design and a traditional approach to the game of golf, Trillium Links is the Hallmark of the Trillium amenities. The Wade Hampton Golf Club was created to provide a superb, 18-hole golf course and complementary Clubhouse facility for the use, entertainment, and enjoyment of its Members, their families, and their guests. The Club is a private, member owned, non-discriminatory, not for profit golf club located in the mountains of Cashiers, NC. Membership is by invitation only. Information and images here resourced from each club's respective website.